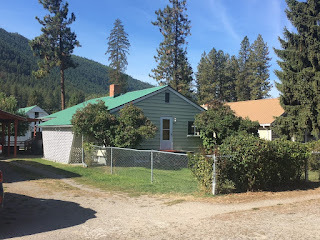 Charming 2 bedroom, 2 bathroom home for sale in Superior, Montana! This place would make the perfect starter home. The cozy estate is located in a quiet neighborhood close to Eva Horning Park and Superior Schools. There are additional bonus rooms and plenty of storage in the walk out style basement. Outside you’ll see a fenced yard with a detached single car garage and access from the alley! The garage has covered storage space, upstairs storage and a workbench. Enjoy the nice fruit trees and a covered back porch with good privacy. The kitchen has been updated with new cabinets, counters and appliances. Convenient in-town living, close to all services you may need. Recreational fun isn’t far either; near the Clark Fork River, Quinn’s Hot Springs and Resort, Flathead Lake, Lolo National Forest and, Lolo Hot Springs! Call Bessie at Spangler Real Estate for more information or to schedule a showing at 406-822-4415. #623 5th Avenue East Superior, MT 59872. Priced at $135,000.